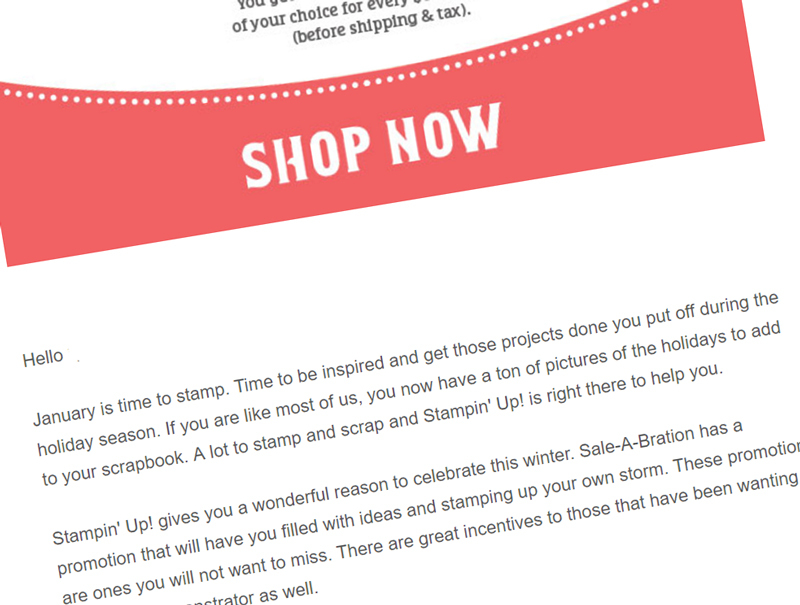 You may be wondering why you, as a Stampin’ Up! Demonstrator, should purchase our done-for-you Newsletter Services when you can create them yourself using DBWS or other Email Service Provider templates. How long does it take you to create a simple email to your customers? 2 hours, maybe more? And what is your time worth? $15 an hour? What could you accomplish with that time? What if we told you we would create a beautiful and professional newsletter for you, including your personalization and a project tutorial for only $10 a month! Could you see the saving? Let us help you spend more time offering one-on-one personal attention or classes, while we do all the heavy lifting. For only $10 a month, our basic membership includes one beautifully designed email each month with a tutorial ready for you to send to your customers. You will need an Email Service Provider such as DBWS, Constant Contact, MailChimp, or similar to use this service. All the work is done for you with our service. You can modify the information to suit your needs. Our email newsletters are professional and are customized with your name, contact information and social media links. Our service provides an easy way to connect to your customers, saves you time, and sets you apart. You stay in contact with your customers, and they feel appreciated and valued which benefits your business relationships both short and long term. Demo Basic: This membership is for the demonstrator who wants to get started in Email Marketing by sending two newsletters a month. It includes two (2) monthly newsletters highlighting special offers, your events, a tutorial, and social media links. Only $10/month. Demo Basic+: This membership is for the demonstrator who has an established customer list and has scheduled events each month. Demo Basic+ includes the monthly newsletter plus a Promotional Newsletter to highlight specials and sales and a newsletter to share your events. Only $20/month! Demo Marketer: This membership is for the serious business demonstrator who needs to stay connected with her customers and team. It includes everything from the Demo Basic+ and mailings to promote your events as well as a team newsletter to inspire, engage, recognize, and retain your team. Only $25/month! Now that you know about all the awesome ways we can help your business and inspire your customers, sign-up for the membership that best fits your needs below and let’s get started. Sign Me Up! Sign Me Up! Sign Me Up! This membership includes monthly customer newsletters (two per month). This is a recurring subscription membership which renews automatically every 3 months based on start date of membership. Cancel at anytime but please allow 4 business days before the renewal period. This membership if for the active demonstrator who hosts events and is building their business. This membership is for the business-minded Stampin' Up! Demonstrator. The plethora of newsletter and invitation options will boost viability to your customers and help you work smarter, not harder. Once you sign-up for the membership and share some basic info with us, we will process your request within 5 business days. Interesting in learning more? CLICK HERE for more information about Email Marketing and our Demonstrator Newsletter Service. Our newsletters will feed into many of the major Email Service Providers. We have experience using Constant Contact, MailChimp, iContact, VerticleResponse, or DBWS. Our service creates HTML for you to import into your account’s campaign. We get asked often which services we recommend. DBWS is a great choice when you are starting out. MailChimp is the service we use, and they have a free membership level. The minimum membership is 3 months, which allows you time to form a successful habit of sending out consistent newsletters. And your customers will thank you for it… Your membership will automatically renew until you cancel. What happens after I sign-up for a membership? After successful payment, you will receive a confirmation email and the option to login to the membership site. We will need to collect basic information from you so we can successfully setup your profile which will be used on all the newsletters. 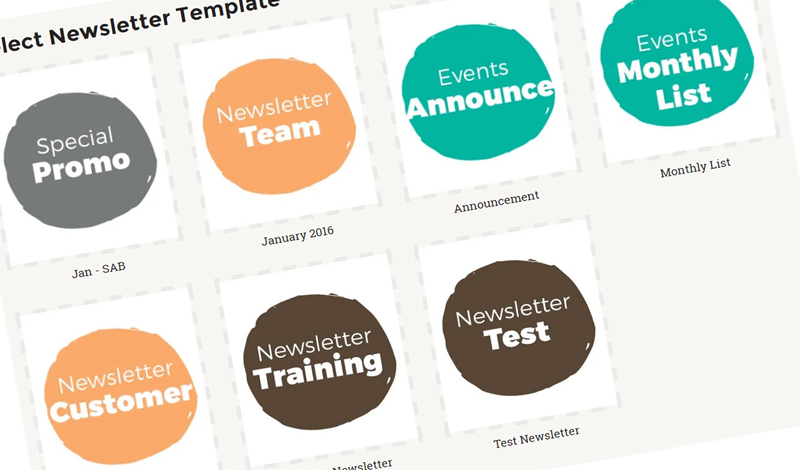 Once the profile is setup, you can start building your newsletters. What day of the month will newsletters be available? The template for each monthly newsletter will be available by the 5th working day of the month. This will give us a few days to see what Stampin’ Up! specials are available and incorporate them into the newsletter for you. We will have the Monthly Events template available for you on the 1st working day of the month. Can I post the newsletter on my blog or add the photos to my DBWS website or share with my downline? No. The CraftyPerson Newsletters are copyrighted material and provided exclusively for YOU to share with YOUR customer base for marketing your business. You can provide the information to your customers through emails or printed copies only. Please DO NOT forward to a community or team website, your downline, sideline, or upline. This includes any demonstrators who are on your customer newsletter distribution. Please refer them to our website craftyperson.com. Cancelling your membership is easy. No questions asked. You can cancel via our membership site or via PayPal. Cancelling your membership does not change the length of the membership and there are no refunds. Your membership will continue until it expires based on the membership date. Yes you can. During checkout, select the PayPal button. You will have an option to select a credit card. Because this is a recurring product, you will be asked to create a PayPal account if you don’t already have one. What is the membership cost and site for? The CraftyPerson Demonstrator Newsletter service is a system that allows you to create newsletters easily and affordably. You become a member and gain access to the system by logging in to a membership site. Your membership fee provides access to the system for 3 months. Your membership will renew every 3 months and you will continue to have uninterrupted access to the system. How many newsletters can I send? We do not limit the amount of newsletters you can personally send. We provide the content for one newsletter each month. For example, if you are a Basic member, we will provide one done-for-you customer newsletter each month. If you are a Marketer member, you will have access to an Event Broadcast template which you can use over and over to send notices to your customers. Is there a Canadian version? Yes. For Canadian members, the CraftyPerson Demonstrator Newsletters present Canadian pricing, links and promotions. We also change certain words (colour, catalogue, favourite) in the newsletter using the Canadian standard spelling. Do you offer other country versions? Yes, we offer Newsletter Services to Canada, United Kingdom, Austria, New Zealand, and Australia. What name will my customers see on all the newsletters? Each and every newsletter will have your name, your email address, your website, your phone number, your social media links, and 5 additional buttons you can customize. Due to the nature of the product, there are no refunds, so please take your time to review the information carefully before purchasing. If you have pre-sales questions, please contact the service department. You can change an images in the newsletters if you have a URL of another image. At this time, we don’t offer a service to upload images from your computer. Better yet, you should upload them on your media outlets such as DBWS, Blog, Facebook Pages, or other public social outlets. That way you get more exposure. From there you can copy your image URL. We’ve also included a plethora of images on our Resource page that have URLs so they are ready for you to use. We’ve built the Demonstrator Newsletter system so you can easily create and send newsletter by yourself. We are available via email to answer any questions you have. We have training videos for you to watch to familiarize yourself with the processes of selecting, modifying, previewing, and copying the code to your chosen Email Service Provider. Our members have asked us to offer a Start-Up Service (details below) to setup and complete the first newsletter. The Start-Up Service is optional and we provide it to assist you in getting started. What is the Start-Up Service? The Start-Up Service is optional and is offered in response to member requests for assistance getting started. We will complete your personalized profile for you. This service is a time saver for busy demonstrators and a great assistance for demonstrators that are not technology confident. The fee for the Start-Up Service is normally $35, but we want you to get started with confidence so we are offering it for free. Do you offer help with setting up our Email Service Provider? At this time we do no offer setup services for Email Service Providers such as MailChimp. We do have instruction on how to send your newsletters out using these services.